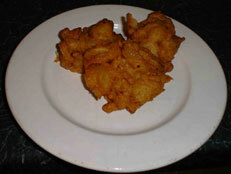 This is my onion bhaji recipe, a variety of pakora using onions. Onion bhajis can be a starter, can accompany a meal or make a nice supper snack; they are now a staple of curry houses in the UK but homemade and fresh they are much, much better. Pakoras are battered, deep fried snacks eaten across all India and made from a variety of vegetables. In Southern India they are usually called bhaji (or some similar spelling). Also confusing is that there is a specific Southern Indian dish called pakoda which is very similar but is specific to onions and prepared in a specific way. 1 breakfast cup gram flour. Onions. I find the huge Spanish onions a bit mild for this but if you really like them, then use them. Spices. The above are suggestions and they work well for me - see options below. I go for about ½ teaspoon of chilli but you can use more or less to taste. Salt. Usual comment - it's not essential in this but a little if you like, leave it out if you are worried about salt. Oil. Rapeseed (canola) or sunflower oil will do fine for this. Mustard oil is really good. Mix all the powdered ingredients together. Add water to make a batter. Cut the onions in quarters lengthwise, then chop not too finely. Mix the chopped onions into the batter making sure they are coated well. Heat oil in a deep frying pan, a saucepan or a wok. Lift a good dollop of batter coated onion (I use an ice cream scoop for this) and drop into the oil. Fry in hot oil until a golden brown colour. Remove with slotted spoon onto kitchen paper. The thickness of the batter is partly personal taste but it needs to be slightly thicker than you would use for other vegetables to hold the onion bhajis together. Make sure the oil is hot - particularly if you are doing several batches, make sure it gets back up to temperature. If using mustard oil then it must be just starting to smoke before frying. Drop into the oil gently to try to keep the bhaji together. A few bits will drift away - don't worry the little bits are nice as well. As you may have noticed this is potentially not just an onion bhaji recipe, there are lots of variations, obviously you can use all sorts of different vegetables. You need to chop them to an appropriate size so that they cook in roughly the same time as the batter. It is best to parboil potatoes. A lot of onion bhaji recipes are quite precise about the spice, and quantities - I really don't think you need to be bound by these suggestions. Spices can be varied to suit your tastes, you can use garam masala, coriander leaves, whole seeds such as nigella, poppy or sesame - you can make it different every time..